Wisconsin Public Television offers us eight educational and entertaining minutes on the subject of hummingbird attractants. Not all of the plants mentioned are native to North America. This video’s autostart feature cannot be changed by code, so while the vid sits on our front page, it will play unless you hit the pause (ll) button. Conservation Maven calls our attention to the newly released U.S. Geological Survey’s first detailed vegetation map of the contiguous 48 states. The map will serve to identify habitat and inform conservation managers about biological diversity in order to build predictive models of wildlife distribution and biodiversity across large geographic areas. View or download the map and read more here. Two new studies published in Biological Conservation indicate that isolated trees dotting agricultural lands prove valuable to wildlife. The two reports — one from Oregon and one from Eastern Australia — demonstrate that remnant tree populations provide significant ecosystem services. Read more here. For a little over a month now, Homemade Wilderness has been presenting news stories and newly released videos of interest to ecological homeowners, gardeners, and landscapers — all in an effort to keep you informed and inspired — with no time lost wandering the Web. You are cordially invited to continue reading the front page daily or access the mounting collection of articles organized by topic in the “Latest Headlines” box. Do you like the service? Then please tell a friend or lots of friends. Visitation numbers confirm the worth of HW’s content. Does your organization or business have news of interest to HW readers? Then please put HW on your press-release mailing list. Posted in NEWS and law. 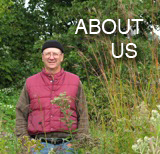 Tags: daily news service, ecological gardeners, habitat, homemade wilderness, INVASIVE species, Joy Buslaff, landscaping, native plants, natural landscaping, naturescaping, rain gardens, wildflowers. Comments Off on Liking Homemade Wilderness?